Shiva Paint Stick Irridescent. 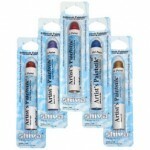 See the full Colour Chart here Shiva Artist's Paintstik Oil Colors are real paint in solid form. They are not crayons, oil pastels or soft pastels, but highly refined drying oils blended with durable pigments and then solidified into stick form. Shiva Paintstic..
Shiva Paint Stick. Series 1 . See the full Colour Chart here Shiva Artist's Paintstik Oil Colors are real paint in solid form. They are not crayons, oil pastels or soft pastels, but highly refined drying oils blended with durable pigments and then solidified into stick form. Shiva Paintstick Oil Co..
Shiva Paint Stick. Series 2. See the full Colour Chart here Shiva Artist's Paintstik Oil Colors are real paint in solid form. They are not crayons, oil pastels or soft pastels, but highly refined drying oils blended with durable pigments and then solidified into stick form. Shiva Paintstick ..
Shiva Paint Stick. Series 3. See the full Colour Chart here Shiva Artist's Paintstik Oil Colors are real paint in solid form. They are not crayons, oil pastels or soft pastels, but highly refined drying oils blended with durable pigments and then solidified into stick form. Shiva Paintstick ..
Shiva Paint Stick. Series 4. See the full Colour Chart here Shiva Artist's Paintstik Oil Colors are real paint in solid form. They are not crayons, oil pastels or soft pastels, but highly refined drying oils blended with durable pigments and then solidified into stick form. Shiva Paintstick ..